Black soap, or African Black Soap, has been used for generations as a natural remedy for acne, eczema, body odor, and to alleviate oily skin. Its many uses include using it as a body soap for cleansing or lathering and using it as a shampoo--all with the main goal of using a natural product to keep skin looking its best. It is not oily, and can be used for hands, face, body and hair. 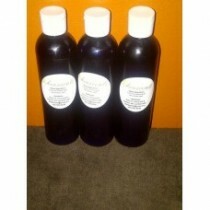 Black Soap will leave your skin soft, smooth and clear. If you’re looking for a natural cleanser to assist in balancing and clarifying your skin, African Black Soap is what you need. Natural black soap originated in West Africa. It is typically a combination of the cocoa pod (husk), plantain skins, coconut oil, palm oil and essential oils. Used for generations, black soap and its benefits have been a staple for the relief of skin blemishes and everyday hygiene. Although its roots are in Africa, black soap is now sold across the world and on the Internet, used by people of all backgrounds. Natural Black Soap is a brownish/black color. Because it's natural and when left unscented, it has more of an earthy scent, which is also beneficial for skin types that are irritated by fragrance.